Charles Marshall labored for breath. Consumption (tuberculosis?) was killing him. He had recently returned to his home at Tytherton in Wiltshire, England and now was unable to go on with his ministry among Quakers. In fact, concerned friends soon moved him into John Padley's house near the river Thames. On this day, November 15, 1698, Charles Marshall died. He was remembered as a man who diligently sought for God. In his journal, The Way of Life Revealed and the Way of Death Discovered, Charles wrote, "About the eleventh and twelfth years of my life, I not only longed to know the true and living God, but also sought after him..."
Charles was seventeen when he heard two Quakers, John Audland and John Camm, speak. 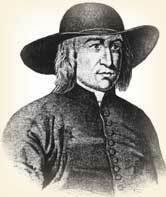 They convinced him that George Fox (founder of the Quakers) had discovered the truth that Charles was seeking. Marshall joined the small but vigorous sect. Within a few years, he found himself in prison for his beliefs because Quakers rejected many of the forms and teachings of established churches. Charles became acutely sensitive to the workings of God within his soul. He had his spiritual ups and downs, his times of doubt and coldness. But he also experienced a state of resignation and peace. "...I found, if at any time I went out from this pure, preserving power of God...and let in the spirit of the world and reasoned, and thereby beheld a beauty in any fruit but what was brought forth by the Tree of Life, then came over me a wound, a stain, a defilement." In 1670 he felt commanded to leave his medical work for a time and preach. Leaving behind his wife and everything he owned, he traveled about England, speaking to four hundred meetings in two years. During this preaching tour, he was arrested, and dragged against some rails with such violence by the agents of the court that he was seriously injured. The court fined him for not attending the established church. In 1682, Charles was thrown into the Fleet Street prison because he held Quaker views. He spent two years there. In spite of his preaching and his years in prison, he managed to keep his journal, write a book, and pen many letters. In one of these he sounded almost apostolic as he wrote [modernized]: "Dear Friends and brethren, that are suffering for your meeting together, in answer to the requirements of the Spirit of Jesus; my love in the fellowship of the sufferings of Christ salutes you, breathing to the God of the spirits of all flesh for you, that the grace that brings salvation, the mercy that comforts, the peace that is as a refreshing river, may be multiplied in you, and among you, to your satisfaction and rejoicing in the Lord." When Charles died on this day, it was found that serving the Lord had not ruined him financially. In fact, he was fairly prosperous, leaving his family a medical practice at Bristol, estates in Pennsylvania, property at Tytherton and Bromhill and shares in a mine in Cumberland. "Charles Marshall." Dictionary of National Biography. London: Smith, Elder and co., 1885-1901. *The quote is from this article. Fremantle, Anne. The Protestant Mystics. Boston: Little, Brown, 1964. Marshall, Charles. The Way of Life Revealed, and the Way of Death Discovered; [microform] London : printed by James Phillips, 1794.